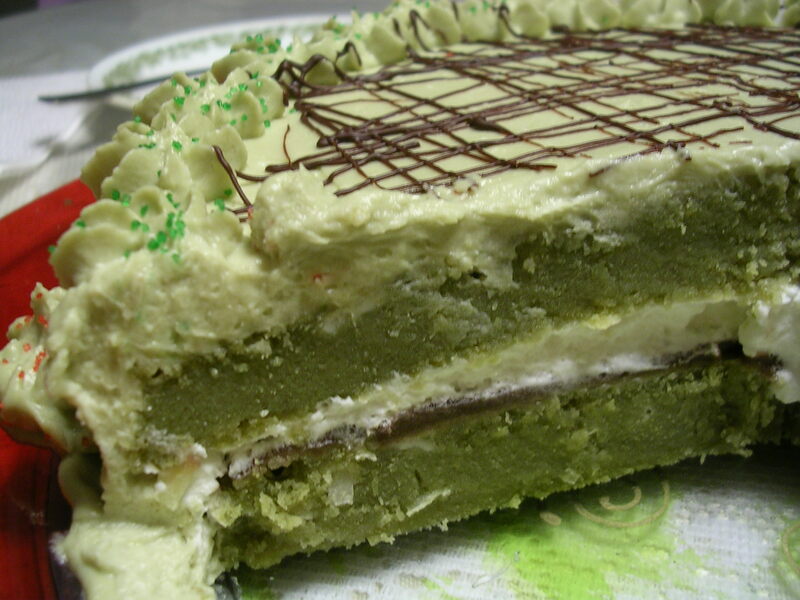 Having gone out of my way to obtain green tea matcha powder, I wanted to put it to use in other baking projects. 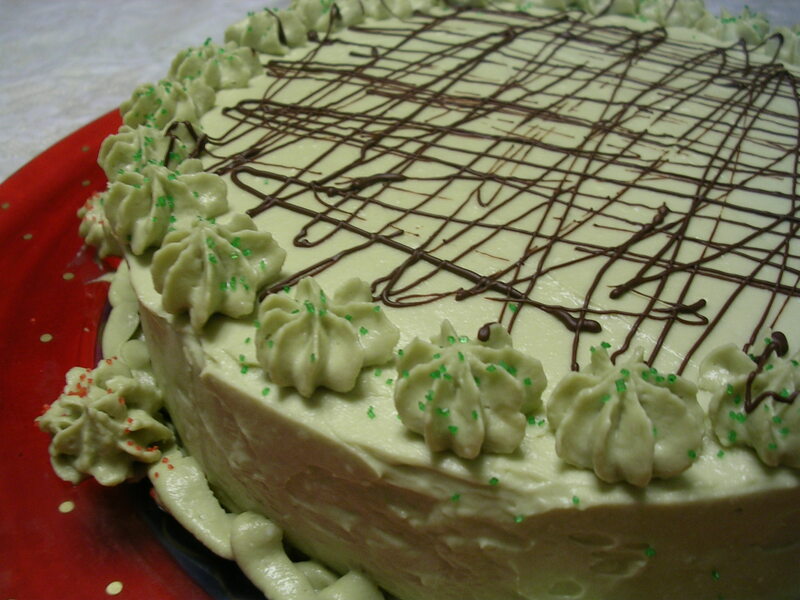 It's been a while since I last attempted a layer cake, so when I found a recipe on Allrecipes.com for green tea layer cake, I wanted to give it a go, with some modifications to the recipe. 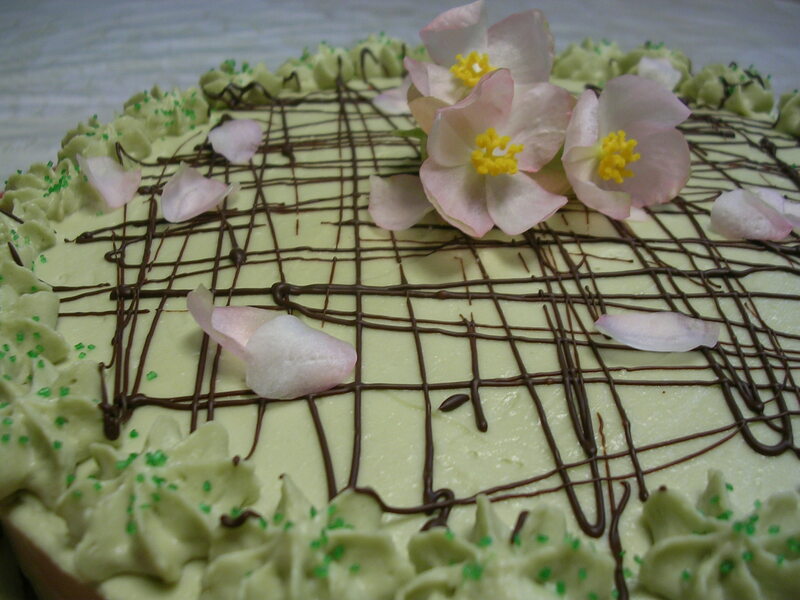 In my modified recipe, this cake has 2 layers flavored with green tea and coconut, with sweet red bean paste (adzuki) and fresh whipped cream sandwiched between the cake layers, and with a delicate green tea flavored cream cheese based frosting. As far as I could tell, the original recipe was supposed to make a cake that was moist and light, though my cake turned out more dense, kind of like pound cake. It was different from what I expected, but I thought the end product came together very well, for a rather unique cake experience unlike the usual airy sponge cakes and light whipped toppings. At first I was wary of the flavor and texture, but after letting the cake set and allowing myself to overcome my initial expectations, I thought it was a really interesting way to highlight the green tea flavor in the cake and the frosting, and that the coconut and red bean paste really added another dimension to the cake. Plus I thought the texture of the cake went perfectly with the red bean paste, it reminded me a lot of my favorite cake of all time, chestnut paste Chinese cake. 1. Preheat oven to 350 degrees F. Grease two 9" round baking pans, line with wax paper, re-grease and flour on top. 2. Sift together flour, salt, baking soda and green tea powder. Set aside. 3. In a large bowl, beat together eggs, sugar, oil and applesauce until smooth. Stir in vanilla. 4. Add the flour mixture and buttermilk in alternating batches to the egg mixture, beating until just incorporated. 5. Beat in coconut cream, and use a spoon to mash out the lumps of coconut cream as best as you can. Stir in flaked coconut. 6. Divide batter between the two pans, and bake for about 30 minutes, until a toothpick inserted into the centers comes out clean. 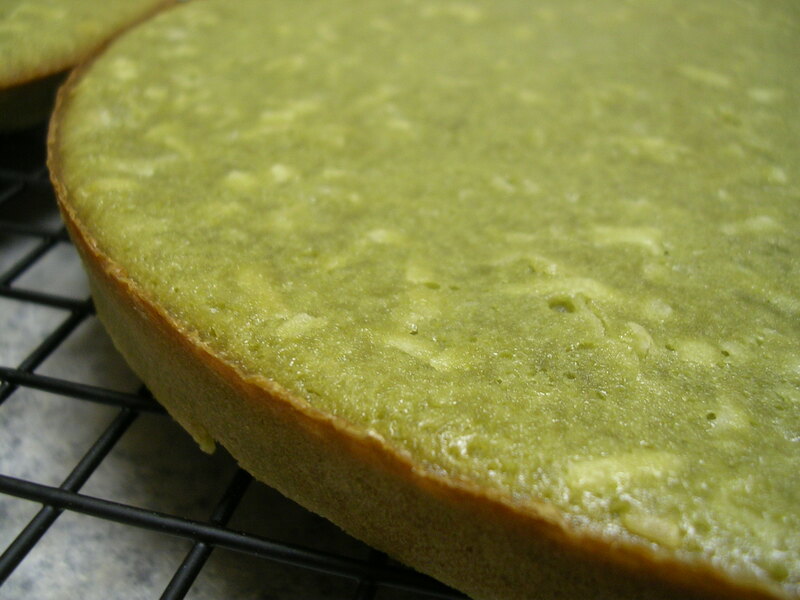 Remove pans from oven, and allow cakes to cool inside the pans for 2 hours before removing and cooling on a cooling rack. 7. Trim off crispy edges of cake rounds (no need to shave off the top and bottom layers of the cake rounds unless they have also gotten crispy). 8. Place one cake round on bottom. Spread a thin layer of red bean paste on top, spreading just about to the edges, since it won't be moving much. 9. Whip up the heavy cream until stiff peaks form. Spread a thick layer over the red bean paste, leaving about 3/4 of an inch of space between the edges. 10. Place second cake round on top, press gently to distribute the whipped cream towards the edges, without squeezing any out. 11. 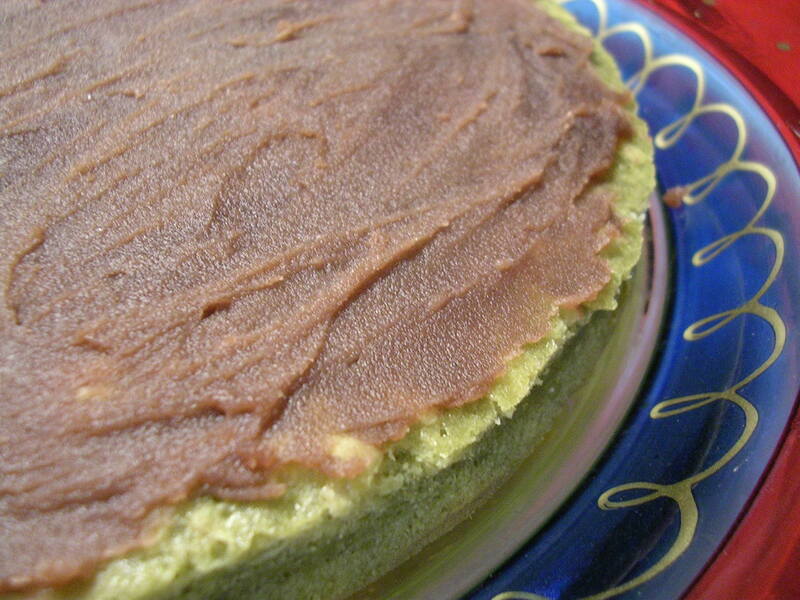 To make the frosting, sift together the sugar and the green tea powder. 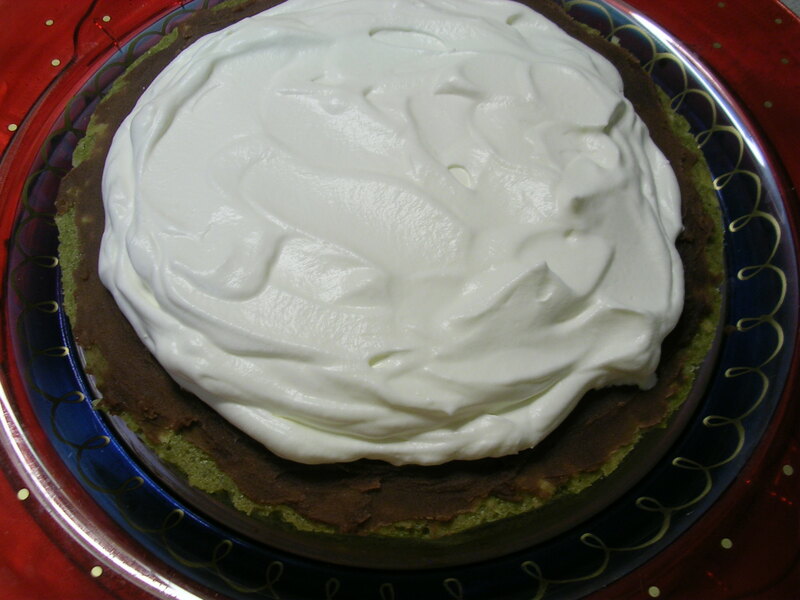 Using an electric mixer, combine with cream cheese, butter, vanilla and milk, beating on low speed until mixture is smooth (the frosting will be a light green). Stir in the remaining whipped cream left over from using for the cake filling. Finally, frost the cake as desired. I melted some semi-sweet chocolate and drizzled it on top by spooning it into a small ziplock bag and cutting open a tiny hole at the tip to use for decorating. 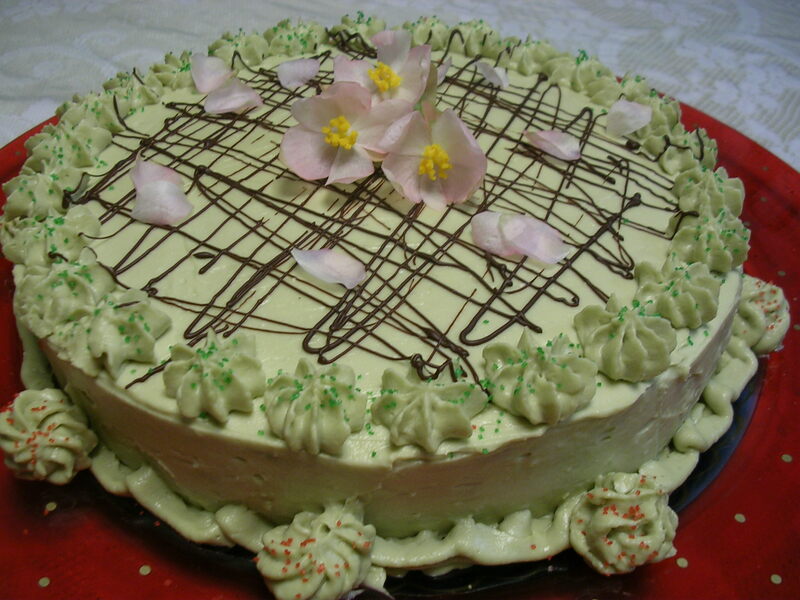 I also sprinkled some colored sugar on top of my frosting flowers just for contrast. This entry was posted on Sunday, December 30th, 2007 at 9:18 am	and posted in baking, desserts, Japanese, recipes, Uncategorized. You can follow any responses to this entry through the RSS 2.0 feed. oh my god, it's so yummy, i wanna bite it now. 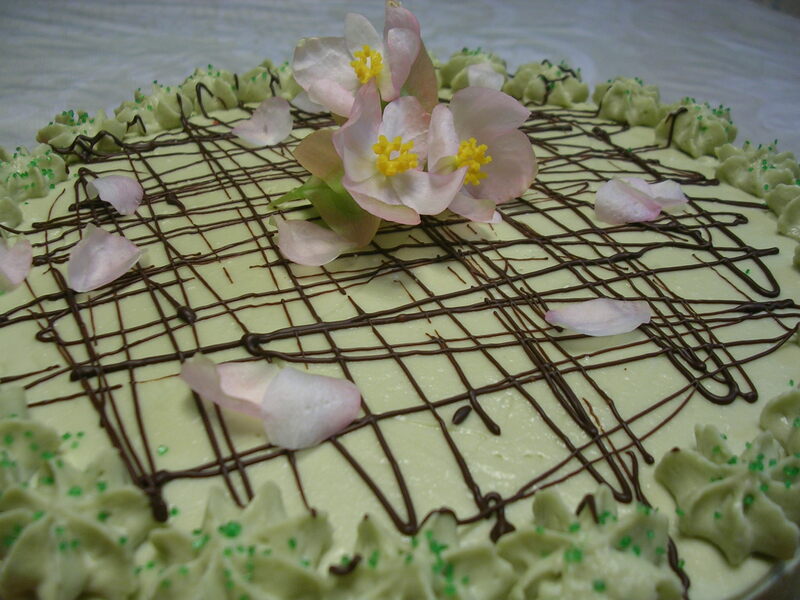 That cake looks so neat and delicious… but still sounds strange lol!